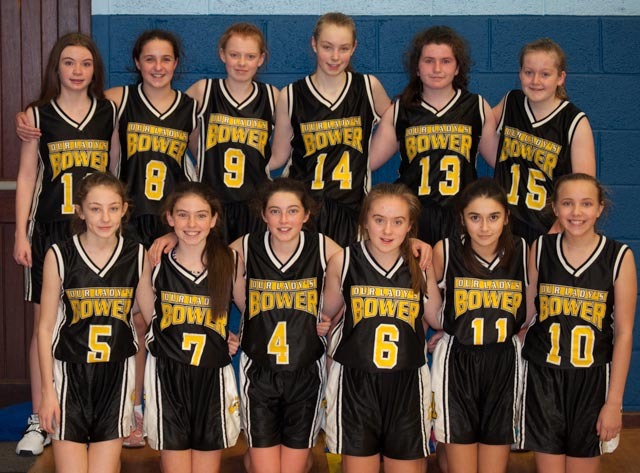 With a place in the national schools cup semi finals up for grabs, Our Lady’s Bower U14s travelled to Our Lady’s Secondary school, Castleblayney, Co Monaghan, to compete in pool 2 of the qualifiers. Only the tournament winner would go through so it was all to play for in every game. This was a tough battle for the Bower girls, their very first competitive outing as a team and nerves were very much in evidence. Colmcille got off to a steady start with the Bower trailing by 4 at the first break. The second 5 for the Bower settled quickly into the fray and evened things up on the scoreboard. Both teams had 18 points at half time. As is very often the case with under 14s it is the team that makes the least mistakes that will triumph and that was the case in this game. The Bower got their noses in front in the third quarter and held a small lead to the end of the game. Colmcille did not take their chances and The Bower held on to win by three. Score at full time; Our Lady’s Bower 36. St Colmcille 33. Game 2. Our Lady’s Bower V Our Lady’s Castleblayney. The host school, Our Lady’s, Castleblayney had designs on winning the tournament and the start of the game was evidence of their intent as they stormed into a 16 to 2 lead against the Bower. Teams do not usually come back from a score like this and it is testament to the Bower that the second five took the floor and ignored the scoreboard until they had evened it up a bit. Holding the home team to 7 they scored 11 points to leave the half time score 23 to 13. Still 10 points adrift, the Bower had some work to do to catch Castleblayney. This team are not one to shy away from a challenge and they were not found wanting. The third quarter was a ding dong battle from start to finish but the tide was turning, as slowly the Bower grew in confidence and the Castleblayney lead diminished. The game continued with little difference until, with 2 minutes and 4 seconds on the clock and down by 5 points, The Bower called a time out and went into the huddle on the side line. The Bower girls came back in and for the remaining time on the clock they put on a full court press. They had stolen the ball twice and scored 4 points before the home team could call a time out and get to their bench. With a minute to go, Castleblayney were now chasing the game and some heavy handed defence on their part put Georgia Munnelly on the free throw line for the Bower. Georgia made both free throws and extended the Bower lead to 4. Time then ran out on Castleblayney and the Bower, after a sensational come back, were deserving winners 36 points to 32. With their tails up and looking for a clean sweep, the Bower went in to the last game of the tournament full of confidence. This was a very different game to the previous one. With both teams starting to tire the game was scrappy. The Bower steadied the ship and stuck to their task and managed a good spread of scores with eight of the players finding the basket during the game. Despite being down by 3 points after the first quarter, they scored 26 points in the remaining three quarters to win 33 points to 27. Three wins from three means that the Our Lady’s Bower U14 team are through to the semi finals of the schools cup, in the National Basketball Arena in February. A terrific achievement for the girls in their first competitive outing in the school colours of Our Lady’s Bower. Well done to them and their coach, Des Reilly. 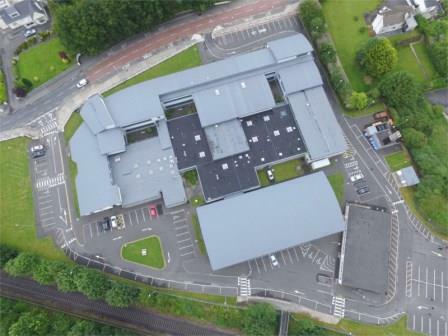 Seó Raidió Sheachtain na Gaeilge sa Ghrianán Mhuire!